The island continent is blessed with a wealth of critters and creatures that can’t be found anywhere else. The best thing about Australia’s wildlife is that it’s seriously unique – and it’s everywhere. You may not see kangaroos hopping down city streets (actually they do on the odd occasion) but you don’t have to step too far into the wild to see some of these totally individual creatures. Due to its relative isolation, much of Australia’s wildlife is endemic, and while most of the world has only placental mammals, it also has marsupials, mammals that nurture their young in a pouch. It’s also got some of the world’s weirdest wildlife, like monotremes: the egg-laying, ant-eating echidna and the platypus – a venomous, egg-laying, duck-billed amphibious mammal – which is acknowledged as one of the strangest creatures in the animal kingdom. Many of Australia’s wildlife icons are found throughout the country, while others are more elusive. Here’s a guide to the best places to see some of its most popular and iconic wildlife. Visit Cradle Mountain and Maria Island in Tasmania for a chance to spot wombats in the wild. Wombats are largely cold climate creatures. You’ll often spot them after dark (they are nocturnal) in the New South Wales Southern Highlands, a 90-minute drive from Sydney, and the Snowy Mountains. Another renowned wombat hang out is the Jenolan Caves precinct of the Blue Mountains, about three hours’ drive from Sydney. In Tasmania, you’ll see them on the Cradle Mountain and Maria Island walks. A tell-tale indicator that wombats are close? They leave behind cube-shaped poop! Thankfully, you can see kangaroos in most parts of Australia. 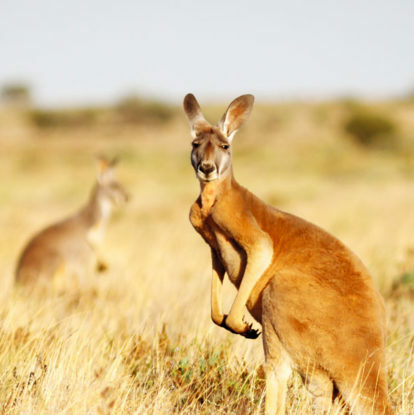 While you can see kangaroos in most parts of Australia – especially exploring the country’s regional areas – there are a few well-known, handy aggregation points. The nation’s capital Canberra has such a large mob (the collective noun for kangaroos) there is an annual debate whether the local government should commence a cull. They are particularly easy to spot on Kangaroo Island (something in the name! ), about two hours and a ferry ride from Adelaide. On the north coast of New South Wales, you’ll almost trip over large groups of kangaroos at Look At Me Now Headland in Coffs Harbour. Touring the Blue Mountains, an hour from Sydney, you’ll see large groups gathered together in the early morning, and for the thrill of seeing them hopping across an outback landscape head to South Australia’s Flinders Ranges. You can even see them laying on the beach at Western Australia’s Lucky Bay. You’ll often see emus running along side you as you drive through the NSW outback or Flinders Ranges five hours north of Adelaide. Emus are more of an outback creature, and you will often see them running alongside you as you drive through outback New South Wales, Victoria, South Australia and the Northern Territory. They are especially common in the Flinders Ranges, not far from South Australia’s wine country in the Adelaide Hills and Clare Valley. Quokkas were mistaken for rats by a Dutch explorer who named the island in Dutch as Rottnest or in English Rat’s nest island. Until these cute little marsupials became Instagram superstars, hardly anyone outside Western Australia had heard of Rottnest Island. A short ferry ride from the capital city of Perth, this holiday resort island has a large, relatively tame (and photogenic) population. Just be sure not to handle the animals; take photos responsibly with the smiling quokkas in the background. Koala’s are found throughout Australia but can be hard to spot. Though koalas are present throughout Australia, one of the best places to see them is in the south-east of the country in Victoria’s Gippsland region and the Otway region of the Great Ocean Road. Echidna Walkabout Nature Tours offer one-day and multi-day trips in Gippsland and along the Great Ocean Road, with guaranteed sightings of koalas. Sightings are also pretty much a given on Queensland’s Magnetic Island (there are around 800 koalas in residence) and on South Australia’s Kangaroo Island, where 18 koalas were introduced in the 1920s to safeguard against extinction; today the population numbers some 27,000. You’ll see plenty of dingoes on Queensland’s Fraser Island. Australia’s largest carnivorous mammal can be found throughout Australia (with the exception of Tasmania), and one of the best places to see them is on Queensland’s Fraser Island, where they wander freely along the wide beaches. Because of their relative isolation and protected status there, Fraser Island dingoes are said to be the most genetically pure. The opportunity to cuddle a koala is available in just two states: Queensland and South Australia. In Queensland, Brisbane’s Lone Pine Koala Sanctuary – the world’s first and largest koala sanctuary – is a great place to do it. On the Gold Coast, get your fix at Dreamworld and Currumbin Wildlife Sanctuary, and further north on Magnetic Island at Bungalow Bay Koala Village. In South Australia, head to Cleland Wildlife Park or Gorge Wildlife Park in the Adelaide suburbs. Spot the shy platypus just outside Sydney in the Blue Lake at Jenolan Caves. The platypus is quite shy, therefore not particularly easy to spot in the wild. One of the easiest places to see them is in the Blue Lake at Jenolan Caves in the Blue Mountains, a three-hour drive from Sydney. You can also spot them in Lake Elizabeth in the Great Otway National Park, Victoria, and Tasmania’s Warrawee Forest Reserve, the “platypus capital of the world”. The ‘Tassie’ Devil’s cute looks can be disarming, think twice before trying to get too close, they can give you a good nip. You can swap the cuddly koala for a little (Tassie) devil, and see some of Australia’s rarest species, by taking a trip to Maria Island, often described as Tasmania’s Noah’s Ark. The island sanctuary is a great place to observe Tasmanian devils, along with Bonorong Wildlife Sanctuary in Brighton, Devils@Cradle, Cradle Mountain, and the Tasmanian Devil Experience at the luxurious Saffire Freycinet on the east coast. Some of Australia’s leading wildlife tourism experiences have united to form Australian Wildlife Journeys. The collection of tour companies represents a wide array of landscapes from coral reefs, rainforests and wetlands to the Red Centre and includes Arkaba Wild Bush Luxury, Echidna Walkabout Nature Tours, Exceptional Kangaroo Island, Exmouth Dive & Whalesharks Ningaloo, Lords Kakadu & Arnhemland Safaris, The Maria Island Walk, Premier Travel Tasmania and Wildlife Coast Cruises. Find out the best times of year to see Australia’s spectacular wildlife by visiting their website. There are plenty of zoos and wildlife parks where you can get up close to Australia’s animals, many of which have hands-on programs and even accommodation options. Taronga Zoo Sydney, one of Australia’s oldest and certainly most well-known zoos, is also one of the world’s most scenic, with sweeping views of Sydney Harbour. It has a range of wildlife encounters including getting up close to a koala; you will go into the koala exhibit for a private talk by one of the knowledgeable zookeepers and finish by having your photo taken. Only an hour’s drive north of Sydney, the Australian Reptile Park has a great selection of hands-on experiences, and not just with reptiles; there are wombats, wallabies, dingoes and Tassie devils. But it’s the hands-on informative keeper talks that make this wildlife park special. There are opportunities to wrap a python around your neck and even cuddle a dingo pup. An hour’s drive south of Sydney, Symbio Wildlife Park is a social media superstar. Its Facebook videos of cute koalas Imogen and Willow have been shared globally and people are flocking to take a photo with these gorgeous girls. Australia Zoo on Queensland’s Sunshine Coast has over 23 hands-on animal encounters, everything from cuddling koalas to feeding kangaroos. There are some big critters there too, including its famous saltwater crocodiles. The vision of the Crocodile Hunter, Steve Irwin, and his family, the zoo is also home to the Australia Zoo Wildlife Hospital, one of the world’s largest and busiest purpose-built wildlife hospitals. Crikey! It’s Australia Zoo – home of the Crocodile Hunter and the most interactive conservation destination on the planet! Cuddle a koala, hand-feed a kangaroo, watch a saltwater crocodile strike and enjoy your ultimate up-close wildlife adventure. A conservation retreat of absolute luxury with villa with private pool, gourmet meals daily, and takeaway picnic and nature activities. Stay on Heron Island for a genuine eco-tourism experience with no day trippers and witness the magic of the world’s largest coral reef. Includes full buffet breakfast and dinner daily, guided snorkeling tour, Heron Island Research Station Tour and more. 3 nights’ accommodation for up to 2 adults and 2 children (under 12) in a Superior Pool View Twin Room. Includes daily buffet breakfast, return ferry transfers, Kids' Cooking Class and Living Reef Experiences.